I am a perky 7-year-old princess who loves to chase squirrels, watch birds and fetch the tennis ball. You would never know my vision is slightly limited. I see everything and don’t miss a beat! I am alert, but slightly timid. I know sit, stay, wait and I will even give you my paw. Counter surfing is not in my bag of tricks! And, I am not thunder phobic! At just under 50 lbs, I‘m the perfect size for any household and I love to follow my person around from room to room. And another bonus, I walk very nicely on a leash! I am a very well mannered little girl. I love going for walks and running around in a fenced in yard. I even like helping you with yard work. I love to be by your side, ready and waiting for when you want to play or go for a walk. I ride great in a car, do great with the groomer, and I let you wipe my paws after being outside. I am pretty easy going. I love always having one of my toys in my mouth and I really like chewing on my Nylabone. I love to lean on you and will roll over for a belly rub any time. Because I’m a bit skittish, an environment with children would not be ideal for me. I think I would like a calm, settled house with my people. 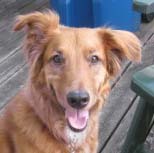 And, as a Golden/Collie mix I take my heritage seriously and like to herd the cats in my foster home. The cats prefer that I not do so! I am irresistable so don’t delay!